The universal cut of all Second You tights and their perfect fit (they’re like a second skin!) makes them suitable for every kind of activity and the unique design will make you want to keep them on even after your workout. The wideband keeps them in place on the hips and guarantees a firm fit - the fabric won’t move even during the most dynamic of exercises. You can be sure that your belly will be held securely and you’ll feel uninhibited even with a short top. The key is the fabric used in making these tights. Not only are they pleasant to the touch but are also breathable and shape your figure. The outer seams that were used in their creation keep the skin safe from irritation while being elastic and ensuring unlimited mobility. How to choose comfortable tights? Before you choose your type of running or yoga tights think about what you’re going to use them for. And think about what is most important to you during training. If your priority lies in looking slim then a good choice would be slimming leggings with a high waist. As for colour, you should choose an even black pair or one with a vertical pattern that will make your legs look skinnier. If you’re not afraid of trying something a bit more out there then pick a bold, ethnic pattern. 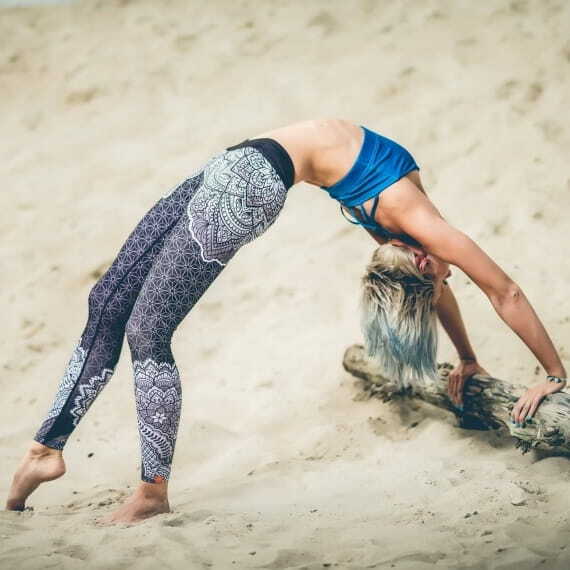 Sure enough, you’ll be pulling all eyes on you during your next yoga or fitness class! Are you planning on having a workout outdoors? You’ll need thermal leggings. Are leggings only good for the mat? - no! Do you loathe spending money for sports clothes you can only wear to your fitness class? So do we! Black tights are universal enough that you can wear them on your next shopping spree or to a party. If you’re looking for something a bit more fancy have a look at some models that have stylish cutouts on the sides - like Snake or Kamala. Our tights are also perfectly suitable thermal underwear during the cold winter months - wear them under your ski pants when you’re planning on your next slope or sledding adventure. What to wear leggings with? During your workout tights will work best with a short top or fitted shirt. When you’re going for a jog on a cool morning think of putting on a sweatshirt - one with a zipper preferably - or add a circle scarf. In an everyday situation, our tights will look great with a cotton T-shirt, a hoodie or a woolen sweater and a windbreaker. In winter combine them with warm uggs or boots and in summer with trainers, flats or sneakers.